here are hundreds of strikes that you can utilize in MMA, but to cover them all would be veering away from a book on MMA. In the upcoming section I've only included the strikes that have worked for me time and again in competition. As you will notice, I didn't include any kicks. The reason for this is because I haven't found kicks to be conducive to my primary style, which is jiu-jitsu. This isn't to say that kicks are not suitable for MMA, because they are. I just prefer punches because they allow me to transition directly into a takedown, and a takedown is what allows me to unleash my jiu-jitsu. Unless you've been living in a box or have been blind your entire life and just got a new set of eyes, you'll probably have seen the upcoming strikes before. However, I cover them not in the context of boxing or kickboxing, but rather in the context of MMA. You will be using these strikes later in the book to help set up other techniques both while standing and on the ground, so it is important to master the dynamics of each one. ^When you punch, keep your opposite hand up to protect your face from counter punches. ^Always remain relaxed. ^Keep your chin tucked. »'When you punch, the shoulder attached to your punching hand should come up and protect your chin. »'Make contact with the knuckles of your middle and index fingers. SDon't let your punch hang out—speedy recovery is just as important as a speedy attack. SDon't let yourself get too spread out when you punch. SDon't telegraph your punches by loading up. ^Put punches together into combinations whenever possible. »Vary the level of your punches to increase your effectiveness. ^Get your hips involved as much as possible. ^As a rule of thumb, you want to exhale upon impact. » Clinch your fist upon impact. ^Use angles and proper footwork to gauge distance. »Use side-to-side movement to set up your attacks. 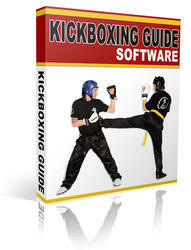 This is a guide that will help you learn everything you are needing to know about kick boxing. You will learn such things as all the safety tips, misconceptions, perfect workouts, all the basics and so much more.